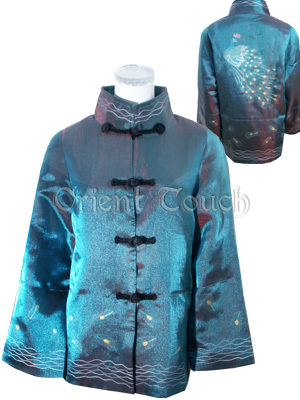 Dazzling and enthralling, this is a stunning jacket! Covered with iridescent voile and embroidered with vivid peacock at the back, this jacket is a wonderful collection for your wardrobe. With handmade velour frogs as well as cloud and feather embroideries at collar, cuffs and cloth lap as adornment, this jacket is full of Chinese oriental taste. Wear this and be the flamboyant peacock of the crowd.